Have you ever bought a gun just because it would be fun to shoot? Many of us are guilty of that. After all, a fun day at the range is a fun day. Period. Large guns, small guns, you name it. Some of the guns we buy are just for the fun of it, and that’s okay. A few years back, I had a Taurus PT-22, a small, compact .22 long rifle pistol that was an absolute delight to shoot. It had barely any recoil and was surprisingly accurate. It brought a smile to my face with every trigger pull. I only had one complaint. It was the ammo. Darn rimfires are not 100 percent reliable. You get a misfire now and then. It’s not a big deal for casual shooting. It’s the price you pay with any rimfire round. Eventually, I sold it for reasons I can’t remember. I miss that gun. I recently revisited the small caliber Taurus, but this time, I went with a more sure-fire cartridge, the .25 ACP. It is a centerfire round, not a rimfire like the .22. The .25 ACP Taurus is the same gun as the PT-22, just a different caliber, and is named the PT-25. It is 4.25” tall and about 5.4” long with a 2.75” barrel. The frame is aluminum and the slide, barrel and internals are steel. Taurus lists it as weighing 12.3 ounces, but mine weighed 13.5 ounces on my scale. 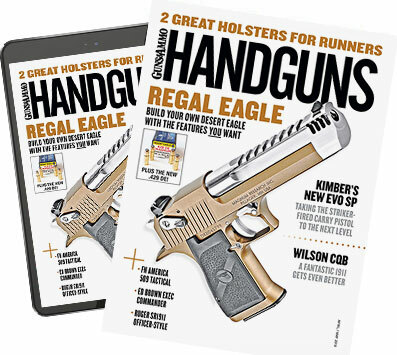 The magazine holds nine rounds. With another round in the chamber, that’s an even 10. That’s a lot of ammo for such a small pistol. Fully loaded, the gun weighed 15.3 ounces on my scale. It’s a little heavy for its size, but this helps to minimize recoil. Taurus offers the PT-22 and PT-25 pistols in a variety of finishes to suit just about any taste, including nickel, stainless steel, blue, gold accents and Rosewood or polymer grips. They also have a new polymer-framed gun with a slightly shorter barrel that weighs some two ounces less than the other models. They are priced very reasonably, with a manufacturer’s suggested price around $300 give or take, depending on the model. My PT-25 had a price tag of $240 at the local gun store. My slide and barrel have a dull blued finish with slightly polished flats. The frame is black with gold-colored trigger, thumb safety, tip-up barrel lever, magazine release and grip screws, and the grips are rosewood. I prefer the stainless or nickel-plated version for their corrosion resistance, but this was the only one in stock at the dealer at the time, so I didn’t complain too loudly and pretended that the gold accents might add a little class to my otherwise classless existence. Okay, maybe not. The pistol is blowback-operated and lacks an extractor, relying on recoil force to push the spent case out of the chamber to interact with the ejector mounted in the frame as the slide moves rearward. It has a thumb safety on the left side. The black sights are small, but adequate. It has a magazine disconnector and will not fire with the magazine removed. In fact, the magazine must be inserted in order to rack the slide. The grip is rather wide and measures 1.25” at its widest point. I like this because it fills my hand. The gun is hammer-fired and the trigger is double-action only. The trigger pull is a little heavy with slight stacking but is very smooth throughout the entire pull. It is capable of double-strike in the event of a misfire. The PT-25 (and PT-22) has a tip-up barrel for easy loading and unloading of a round in the chamber. The barrel is released via a lever on the left side. You can also load the chamber the old fashioned way by racking the slide. However, I was surprised by how much strength it took to rack the slide manually. It takes He-Man-level effort and a hell of a grip, because the slide is small and there isn’t much to grab a hold of. Don’t bother with this method. The tip-up barrel is a godsend and makes loading very easy. Use it. This model has the Taurus Security System, which locks the action, so the gun will not function. It is engaged with a key that is inserted in the lock in the backstrap and must be rotated 180 ̊ to lock or unlock the mechanism. Two keys are provided. While some folks disparage the locks that are included on many modern firearms these days, I like them. They are an additional safety mechanism to prevent them from being used by unauthorized personnel. For the people that don’t like it? Ignore it. It doesn’t interfere with the gun’s operation when disengaged. The .25 ACP cartridge was created by none other than the legendary John Browning in 1905. Yup, it’s been around for more than a century. Its diminutive size allows it to be chambered in tiny pistols that easily fit a pocket or purse. Being centerfire, it isn’t prone to the misfires that plague rimfires. One funny thing about this round is that the base is so small and the small pistol primer is so large (relatively) that you need a magnifying glass to read the caliber and manufacturer stamp. The .25 ACP is a semi-rimmed cartridge the same as the .32 ACP and .38 ACP (not to be confused with the rimless .380 ACP), all designed by Mr. Browning. The purpose was to have the cartridge headspace on the semi rim. The usual load for the .25 ACP is a 50 grain FMJ bullet that runs about 760 fps from a 2” barrel. Winchester also loads a 45 grain JHP to 815 fps, and Hornady offers a 35 grain XTP bullet at 900 fps. Muzzle energy values run in the range of 60-70 ft-lbs. The only .25 ACP ammunition I could find online or at the local gun stores at the time was a PPU (Prvi Partizan) and Aguila 50 grain FMJ. Yes, the ammo shortage affects even these little guys. I fired 170 rounds of this mixture. I experienced three failures to completely eject during the first 70 rounds, two during the slow-fired 10-shot group accuracy test and one while shooting one-handed. They were easily cleared. I attributed these malfunctions to limp-wristing and general break-in. There were no malfunctions in the last 100 rounds fired. Ejection was upward with a tendency to be to the right, with some brass going forward and behind me. The pistol is quite accurate for its short sight radius, and produced a 2.25” 10-shot group fired offhand with PPU ammunition at seven yards in spite of my poor vision. The double-action trigger isn’t the best for precise target shooting, but this is not a target gun, and as you can tell from the 10-shot group, it does not hinder the gun’s potential to shoot straight. Ten shots of the PPU ammunition over a Shooting Chrony chronograph at about 10 feet averaged 736 fps (this ammunition has an advertised velocity of 771 fps from a 2” barrel). The PT-25 points naturally, so I could almost ignore the sights for close targets - just point it at the target and start pulling the trigger. Was it fun to shoot? Yes! This gun is just like its .22 caliber brother: little recoil but serious fun. Would this be a good carry gun for self defense? Most people scoff at the idea of using a .25 (or .22) as a carry gun. The .25 ACP is not a real man-stopper. It is simply a cartridge of convenience because of its small size. Its advantage is that the gun can be really small, and in the case of the Taurus, it enables high capacity. Ten rounds is, well, 10 rounds, and a larger caliber would result in less rounds or a larger gun. By the way, the PT-22 holds one round less because its magazine only holds eight rounds, so to get the most ammo, go with the PT-25. For comparison, one of my current carry guns is a Taurus PT 738 .380 Automatic. It is about the same size as the PT-25 but holds less ammo with a capacity of 6+1. The .380 is a much more powerful round, but the PT 738 will run out of ammo faster. It’s always a tradeoff between power and capacity. More power means more recoil and less ammo in the same size gun. Even if you don’t consider the PT-25 as a good choice for a primary carry gun, it could serve as a backup gun. Having 10 shots for backup is not a bad thing, and the Taurus‘ small size is easy to carry. It also makes a nice kit gun. The downside to the PT-25 is the cost of ammunition. Round for round, .25 ACP costs about the same as 9mm Luger ammunition. If you’re getting one just for fun, consider the PT-22 to save money on ammunition. If you might use it for a defensive gun, the surefire reliability of centerfire .25 ACP is worth the extra cost for ammunition. Or get both! Beretta makes similar pistols in .22 long rifle and .25 ACP, the Bobcat. It has less magazine capacity at seven rounds plus one in the chamber for a total of eight rounds. They also have a .32 ACP version, the Tomcat, with the same 7 + 1 capacity. One significant design difference is that the Berettas are single/double action while the Taurus is double action only. The Berettas’ suggested retail price is around $400. These small Taurus pistols rank high on the fun scale. Whether it’s a .22 or a .25, they’re guaranteed to make you smile.